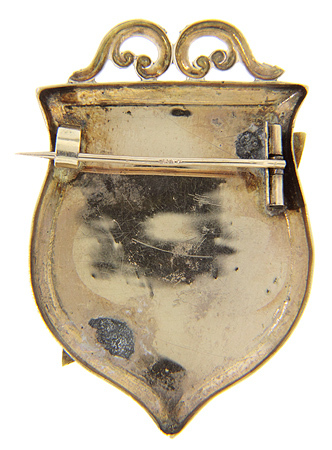 Antique Victorian 14K rose gold buckle pin with black enameling on buckle. The flowing ribbon is in yellow gold with intricate engraving and set with three seed pearls. The contrast of the plain plaque and the detailed engraving on the ribbon is striking. 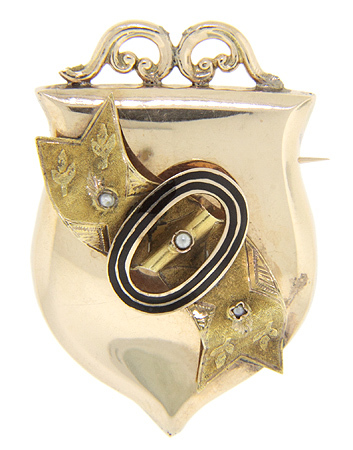 The brooch measures 2 1/8" by 1 1/2" and still has its original "C" clasp. Circa: 1860.